My friend Becky gave me this lovely peacock feather stamp for Christmas. I’ve been meaning to use it for a long time, and finally, I have! I’ll pop it in the mail this weekend as a thank-you to her. I think she will appreciate it! My friend bought this peacock stamp for me, so it’s only fitting that I make a card with it for her! 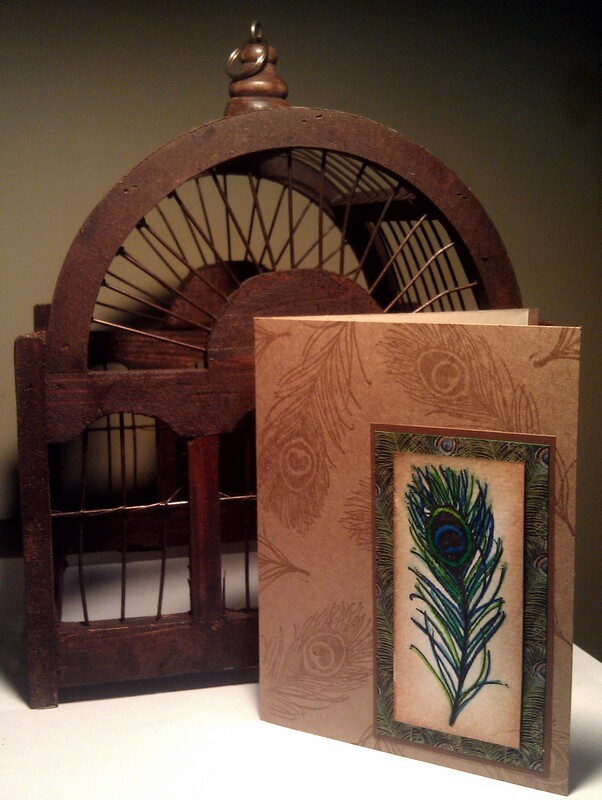 I used a 5″ x 6.5″ kraft cardstock base and Versamark Ink to create a subtle watermark background with the Peacock Feather stamp, which is a wooden one from Stampendous. I used the stamp on watercolor paper in Versafine black ink and colored it in with my Inktense pencils in various shades of blue and green. Then I took my water brush and lightly painted over it to blend the colors. Finally, I used Tim Holtz Distress Ink in Tea Dye to shade the edges to better complement the kraft paper. I adhered the colored feather image to a slightly larger piece of peacock feather paper from Graphic 45. I matted that with a dark brown paper and adhered to the lower right corner of the card. 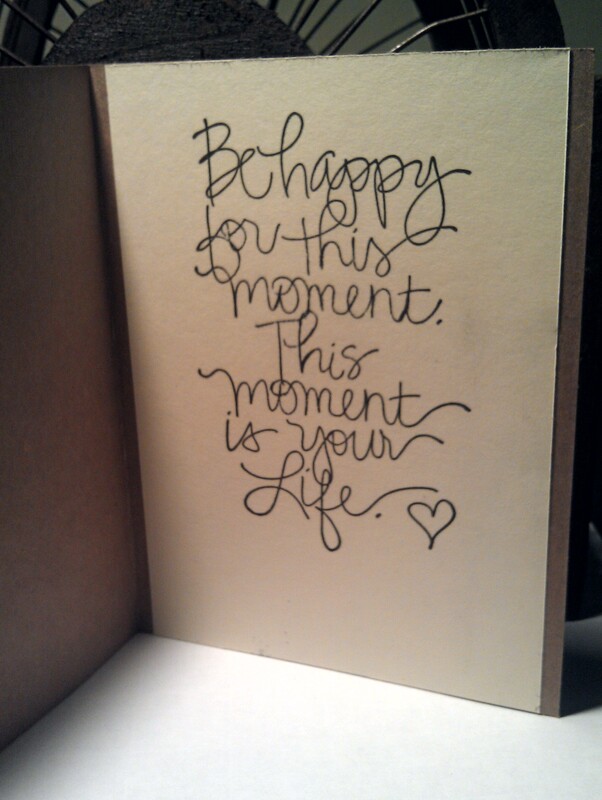 I had planned to stamp the sentiment directly to the inside of the card, but somehow I smeared black ink on the inside! So instead I stamped it on ivory card stock and adhered that to the inside of the card, with just a little of the kraft paper peeking out on the sides. The sentiment is on a wooden stamp from Ditto. As a lover of peacocks, I think I’m pretty happy with it! Enjoy! I think I’m pretty happy with this card. I tried to stick pretty closely to the class instructions. I inked the center panel (water color paper, approximately two and a half inches wide) with three Tim Holtz Distress Inks in Dusty Concord on the bottom, Picked Raspberry in the middle, and Spun Sugar at the top. First I spritzed all three colors on my craft sheet with water, swished the paper around, and then sprinked it with sea salt. Then I dried it with my heat tool. 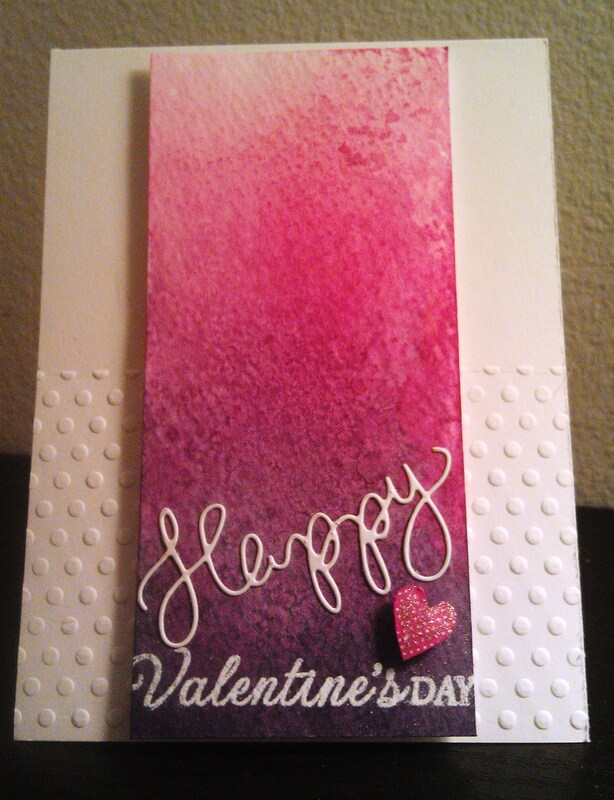 Next I embossed the Valentine’s Day sentiment in Versamark ink and detailed white embossing powder. I added the Happy die cut (from the Oh Happy Day die cut set at Simon Says Stamp) at an angle, adhered with my Tombow mono glue. I didn’t have a heart die cut in the right size, so I fussy-cut a polkadot heart from a paper pad set and added a little glitz with my jelly roll pen. I adhered the panel in the center of the card panel with foam adhesive. I dry embossed the bottom part of the card front with a Cuttlebug Polka Dots embossing folder. Now, my next dilemma is: Who should receive this lovely Valentine’s Day card?